Last week was pretty chilled for me as my boss was ill so I worked from home for most of it. Lately I haven't been wanting to leave the house much. I suppose the flu was a big factor in that but also I've been enjoying a lot of TV series lately and trying to fit in as many workouts as I can in preparation for my holiday, as well as spending lots of time with my sister before I go. Anywho this is the round up of my week. 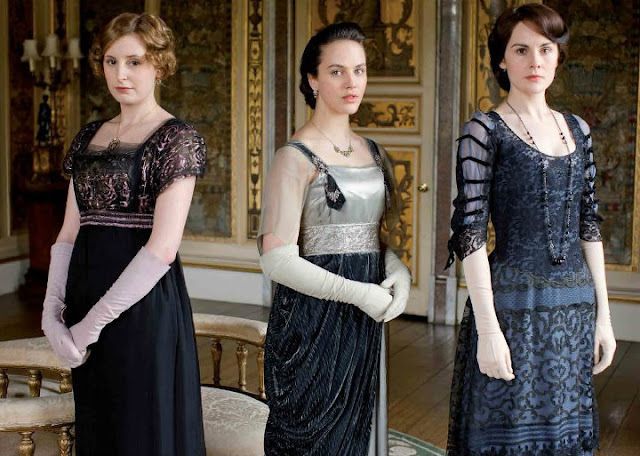 The second season of Downton Abbey premiered on Sunday. Who doesn’t love a period drama dripping in scandal, bridled affections, intriguing characters and endearing romance? Needless to say, I'm hooked. Offspring – not much to say except best Aussie drama on TV. 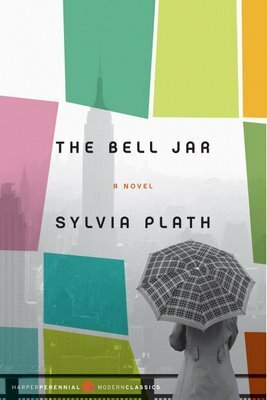 Reading The Bell Jar by Sylvia Plath. I've been meaning to tick a few more classics off my reading list and this novel was mentioned in a recent issue of Russh which prompted me to download it on my tablet. I had a vague idea the book was about a young woman in New York and her decent into mental illness although, I didn't realise how depressing it was going to be. I'm over half way through at this point in time, but I'm hoping to finish it this week. Despite the discouraging and bleak subject matter there are moments of humour that break it up where I find myself smirking at the main character's observations and descriptions of events. However, I'm definately set on finding a perkier book for my next read. I can only stand so much doom and gloom. Something in the vein of Zoe Foster's The Younger Man, which I read a couple weeks ago, would be great! With the weather cooling, lounging around reading with a comforting warm serve of tea seems even more appealing, so I’ve been on the hunt for some new flavours. A few weeks ago I picked up some loose leaf tea from T2. Anyone remotely close to me would know I love a good dose of tea. Some days I drink so much I practically sweat the stuff. Anyhow after a good 20mins deliberating over which flavour to choose I settled on a delightful blend of Roobis and Vanilla fittingly named Red Green Vanilla. I was after a blend that is not only tasty but super wholesome and as I was already aware of the health benefits of Roobis and love the flavour of vanilla, it seemed the perfect choice. And I have to announce it is delicious! Even my mum who meets all my new food purchases with an eye of scepticism was raving about it. Now that I'm hooked on T2 I can't wait to go back and pick up some new flavours. On a side note, recently I had about a small tea cup full left over in a tea pot that had gone cold when I left it in the kitchen. Not wanting to waste it I impulsively threw it in with a raw hot cocoa drink I was making not thinking it would make much difference to the flavour of it. Boy was I wrong! The tea added such a unique delicate fruitiness that had me noticing it at each sip. 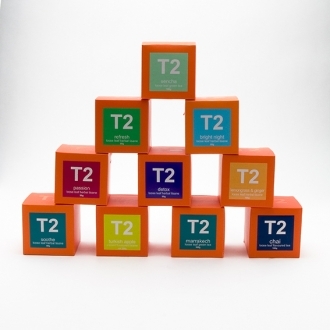 What's your fave T2 flavour? 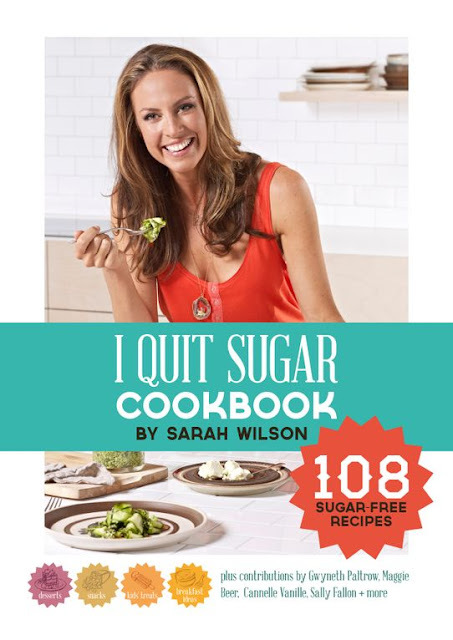 Sarah Wilsons I Quit Sugar Cookbook arrived in my inbox. After giving it a quick browse I’m super eager to try the Kale Pesto, Chocolate Coconut Butter, Choc Berry Mud and Superfood Popcorn. All the recipes sound delish and uncomplicated to recreate. If you’re keen to reduce or eliminate sugar from your diet I definitely recommend you purchase a copy of the recipe e-book ($19). Although I’d advise you to read her e-book I Quit Sugar ($19) first if you haven’t already to get a sense of her eating philosophy and why being mindful of sugar in your diet is a good idea. 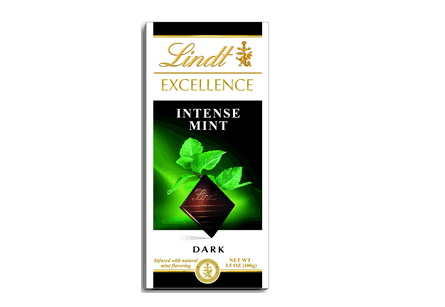 Now to completely contradict myselt :)...Woolworths had a special on Lindt chocolate this week so I couldn’t help picking up a bunch of dark chocolate – my favourite 85% dark in addition to some flavours I haven't tried before including Mint Intense and Passion Fruit Intense. I can't believe I hadn't tried the mint flavour sooner. If you like minty chocolate, you will go crazy over this stuff! In awareness of my addiction to Lindt dark chocolate bars I picked up 5. Let’s just say I’m finding no trouble working my way through them. Mum’s also become obsessed with making these apple custard pastries the past couple weeks and I’ve become obsessed with eating them. They are super easy to make. Slice a piece of puff pastry in quarters add a dollop of custard on each quarter and spread over half of the piece diagonally. 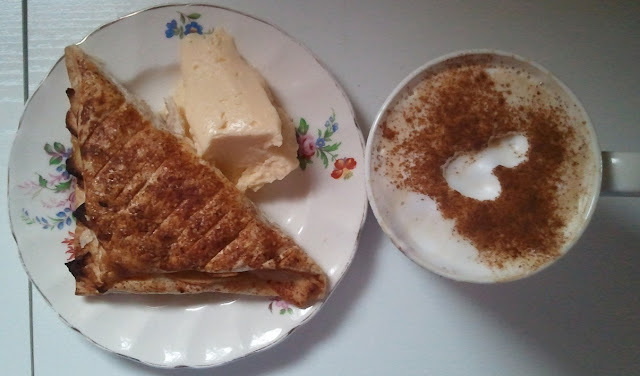 Make a batch of slice apples mixed with lemon juice, a sprinkle of sugar and cinnamon and layer over the custard. Fold each quarter in half on the diagonal, brush with egg white and give each piece a final sprinkle of cinnamon (and sugar if you wish). Pop in the oven on 180C for about 30mins or until golden brown. Serve with your fave cup of sweet tea, chai, coffee or with ice cream. I like mine with extra warm custard on the side. And then I like to eat another one. On Saturday I treated myself and a friend to an infrared sauna. I had read some pretty interesting things about them and a long list of benefits. Essentially the infrared sauna heats you from the inside out rather than heating the air around you causing you to detoxify by sweating out all sorts of nasty stuff. We stuck it out for half an hour at which point we were sweating like crazy. They are quite exxy for regular use but if you have a health problem and prefer a natural approach to healing and detoxifying, it's worth checking out. Personally, I found the session nice and relaxing and definately felt like I was sweating out some gunk, but you would probably need more than one session to notice a significant impact. When I was researching infrared saunas in my area I came across a lot of websites selling them for around the $1700 mark, which is less than I expected. My dream house would definately contain one of these. I imagine it would be a great hub for daily meditation and relaxation. If you're interested in learning more you can read a blog post by Sarah Wilson discussing them here. Luckily I spent two hours at the gym Sunday morning as mum decided to make pizza, carrot cake and chocolate cake on Sunday night. 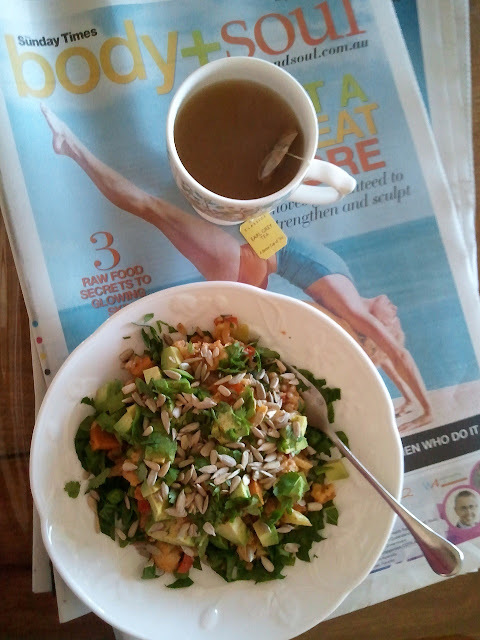 However, I did have a healthy lunch post workout so I believe that cancels out any damage done by pizza :). It's hard to watch a Beyonce video clip without wanting to move your toosh! Well, that's a wrap folks. Yeh it's a good one cause all the dishes are really unomplicated which is what you need when you work fulltime and don't have ages to spend in the kitchen. Happy to hear it made an impact! Definately worth it if it works for you! 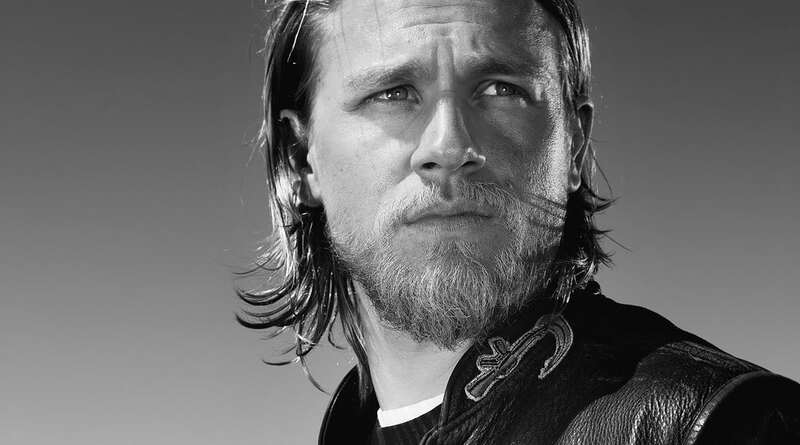 SOA is actually one of my favorite shows at the moment and I'm completely obsessed with Jackson Teller!